Over the last four decades, Silicon Valley repeatedly has reinvented itself to place itself on the cutting edge of the information technologies and information technology-based business models. What is most interesting is that a number of these technologies and business models have in Steve Jobs’ words “changed the world.” Kenney will explore the historical evolution of the region and the development of a powerful innovation ecosystem that has become self-reinforcing. The talk briefly describes the evolution of the central actors in the ecosystem including venture capitalists, law firms, entrepreneurs, human resources, and public goods such as universities. Kenney will conclude with a discussion of how the current generation of firms are built upon digital platforms that have winner-take-all characteristics due to network effects that, perhaps, have made Silicon Valley firms more dominant than ever. Martin Kenney, Professor of Human and Community Development, UC Davis; senior project director at BRIE, UC Berkeley. Martin Kenney is a Distinguished Professor of Community and Regional Development at the University of California, Davis; a Senior Project Director at the Berkeley Roundtable on the International Economy; and Senior Fellow at the Research Institute for the Finnish Economy. He has been a visiting scholar at the Copenhagen Business School, Cambridge, Hitotsubashi, Kobe, Stanford, Tokyo Universities, and UC San Diego. His scholarly interests are in entrepreneurial high-technology regions, technology transfer, the venture capital industry, and the impacts of online platforms on corporate strategy, industrial structures and labor relations. He co-authored or edited seven books and 150 scholarly articles. His first book Biotechnology: The University-Industrial Complex was published by Yale University Press. 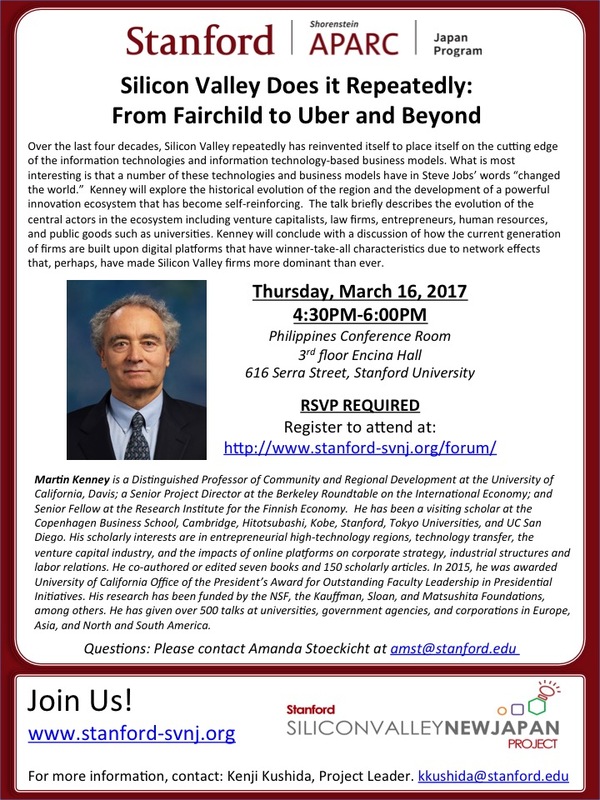 His most recent edited books Public Universities and Regional Growth, Understanding Silicon Valley, and Locating Global Advantage were published by Stanford University Press where he edits the book series Innovation and Technological Change in the Global Economy. His co-edited book Building Innovation Capacity in China was published by Cambridge University Press in 2016 and has been translated into Chinese. He is a receiving editor at the world’s premier innovation research journal, Research Policy and edits a Stanford University book series. In 2015, he was awarded University of California Office of the President’s Award for Outstanding Faculty Leadership in Presidential Initiatives. His research has been funded by the NSF, the Kauffman, Sloan, and Matsushita Foundations, among others. He has given over 500 talks at universities, government agencies, and corporations in Europe, Asia, and North and South America.